Not a lot of Hispanic/Latino folk nearby, but bears celebration anyway. On Sunday Bode broke his collar when he put on a spurt of power to chase Tim’s tractor as he pulled a manure spreader by. Fortunately I got him back before he got a chance to roll in it. So, instead of a nylon ribbon collar with a clasp, I opted for a leather one with a buckle and heavier hardware. Wednesday I decided to go the hardware to get a new collar and some more gardening supplies — been transplanting up a lot. There were a many trees with white flowers in the woods on the way. 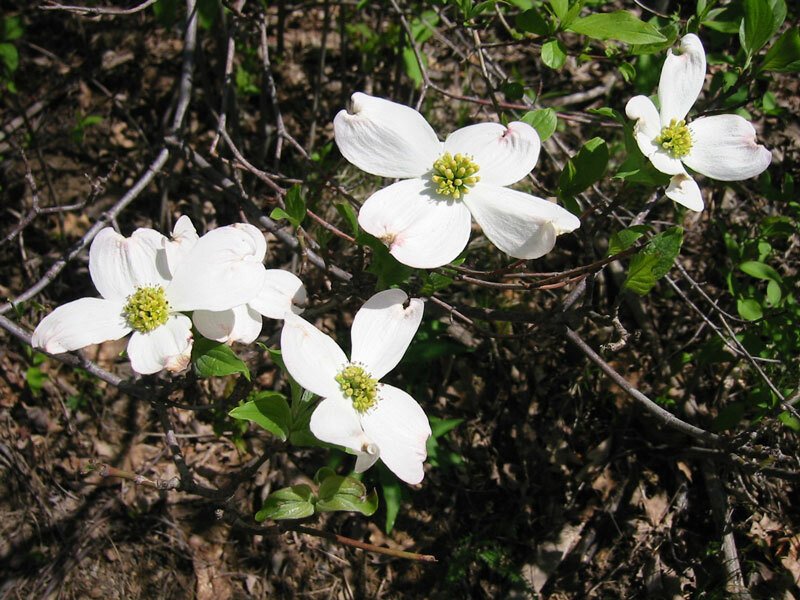 About half way to Rural Valley I realized many were dogwoods. I haven’t been here when they were blooming for many years. The May apples (wild mandrake) are up too. The bake sale for Mother’s woman’s group is today. Back when there was snow on the ground, I got Bode to come down from the lane above the house by calling cook-ie! and rattling a cellophane bag containing some kibble. At the time I wondered if his name might be Cookie. Yesterday he came in from sentry duty on the porch while I was cooling two pans of bar cookies on the table. He lifted his head, put back his ears, and sniffed the air, much the way he does out in the grass only up in the air. Cookie is probably a favorite snack rather than his name. Well, the scent of lilac blooms are in the air and it is a beautiful day. Bye for now.